I have been riding the Jones H bar for about 3 months now and I think I will give an initial review. I have to say that I think it is fantabulous. I have logged several hundred miles with the handlebar. No tours as of yet, so I will have to update once I have taken it out fully loaded. 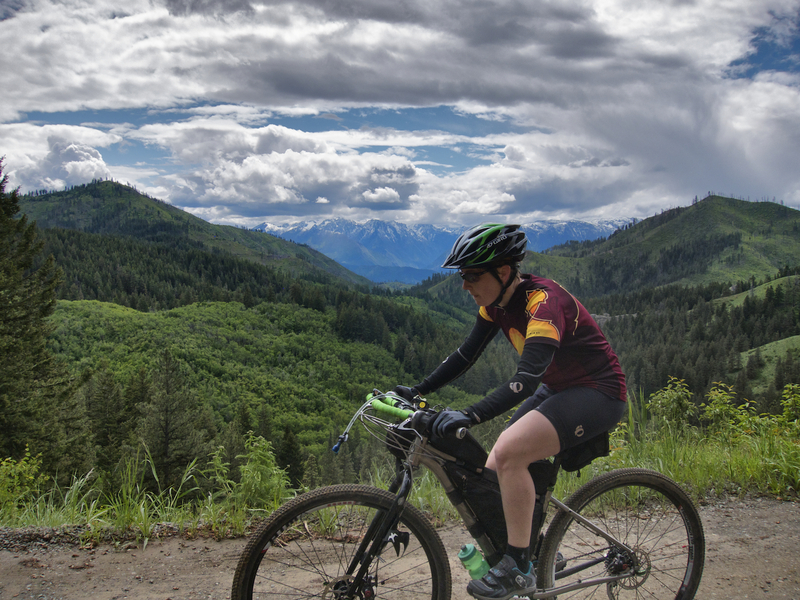 I have ridden it for a long ride of over 7 hours, and in a variety of conditions including paved road, gravel and dirt roads and single track. I have a personal mechanic (Josh), who put it on my Salsa Fargo small frame. The bike is actually designed for a drop bar and has shorter top tube than a standard MTB. I had to go with a 90 mm stem. I am pretty short at only 5'4". The backsweep of the bar makes it important to take your time fitting a proper stem length depending on your frame design. On a standard mountain bike with a longer top tube I do not think this would be an issue at all. To complete the set up I added Grip Shift Attack 9 speed shifters and Paul Love Lever 2.5 brake levers. I also put on Ergon GP1 short grips. I wrapped the bar in some beautiful green Salsa cork tape. Once set up it was time to ride. Being a smaller rider I was a bit concerned about riding a 29er. The H bar is nice and wide, 660 mm wide at the widest. 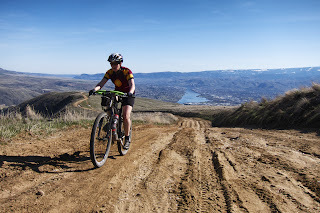 I find the wide bar gives me lots of control and leverage to crank up hills and descend in tight corners on technical single track. 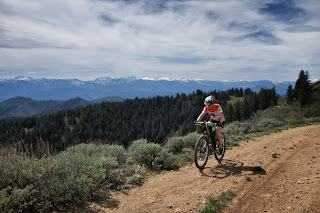 The bar has lots of hand positions but I noticed that on more technical types of terrain I spend most of the time with my hands in the widest position on the Ergon grips at the ends of the bar. This position gives the most control. On smoother or flatter sections I like to take advantage of all the other positions. I can stretch out my hands and fingers in the loop or ride in an almost aero position on the front of the loop. The front position is also great for stretching out your back. The super snazzy loop shape also is great for attaching all your bike gizmos to the bar. So far I have only my computer on the bike but even with my front bedroll attached I still have plenty of space for aero bars, gps, lights and what have you. The drawbacks of the bars are that they are a little bit on the portly side at 502 gm according to the Jones website. I think the weight reflects the durability of the bar. It seems to be extremely well made with nice smooth welds and feels like it will never break. I don't notice the extra weight while riding. The other potential drawback is the sweep of the bar leaves your brake levers a bit exposed during a crash. I purposely left the levers a bit loose so they move rather than bend in a fall. So far have only fallen on soft mud (knock wood), but the arrangement worked well and the lever moved but no damage done. All in all I would highly recommend this bar to anyone looking for a mountain bike bar with lots of hand positions and space to hang all your doodads and gear. In fact it is the only bar so far that has actually tempted Josh to consider changing out his beloved Salsa Woodchipper drop bar. I am excited to take it on a tour in a couple of weeks and see how it fares in the long haul. Will keep you posted. I have now gone on a tour with this bar and I love it! 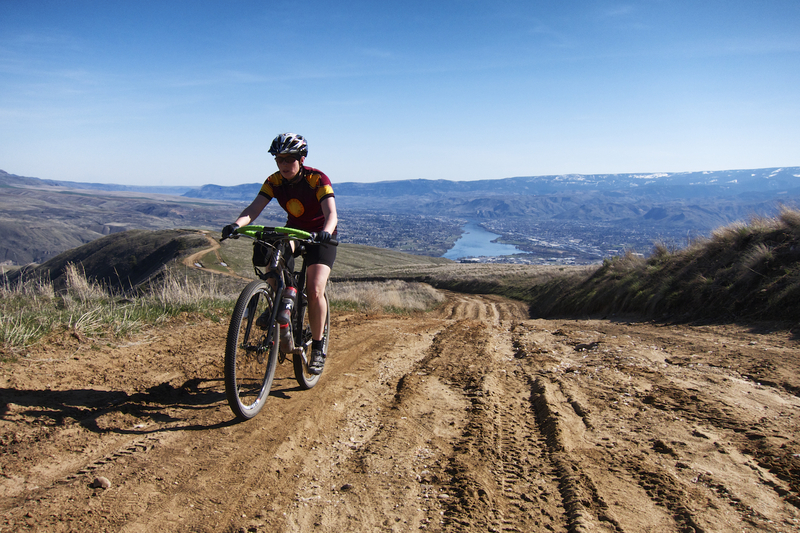 We rode from Ovando, Mt to Helena and back, then up to Seeley Lake on the Great Divide route and other roads. I did put on aerobars, but really I think they are overkill unless you are doing a whole bunch of riding on flat roads. I hardly used them. I attached my front roll with the Revelate Sling. I won't be using the sling again as I found that it works just as well to use the Revelate pocket and straps around the Jones Bar. The bike handled well with the load on the bar and it did not get in my way. I didn't have any numb hands, cramps or back pain. I stretched my fingers, my electronics were all attached and stayed that way. 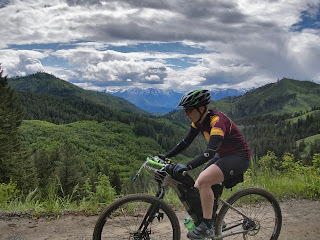 I crashed in the mud and rocks on the top of the Great Divide and my brake levers stayed intact. Overall I am super happy with the bar and plan to keep using it. 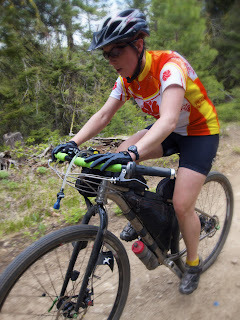 Valerie Completed the 2014 Tour Divide race with her Jones Loop H-bar in a finishing time of 27 days and several hours. The 3rd place female finisher of the Grand Depart. Bravo Valerie! The Jones bar continues to be a perfect match for her Salsa Fargo. I am very jealous of both your bike and your handle bar. It would be nice to be able to put my hands in so many positions. But...I am never going on a bike tour. Probably. The bright green tape makes me rethink my position on that crazy sport. --from the fly bird. Good review. Lovely shots. Keep up the riding! Hi, thanks for the review. I'm planning on using my H-Bar (which is in the mail!) in much the same way as you. Do you take requests? Would you mind posting a top-down, point-of-view photo of your cockpit setup? I'd like to see how the grips and levers look. 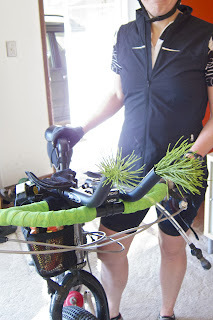 I'm thinking of using the Ergon cork grips, and I'd like to see how they look set up. Thanks, and happy riding. Hope you like your bars as much as I have. The Ergon grips are fantastic. 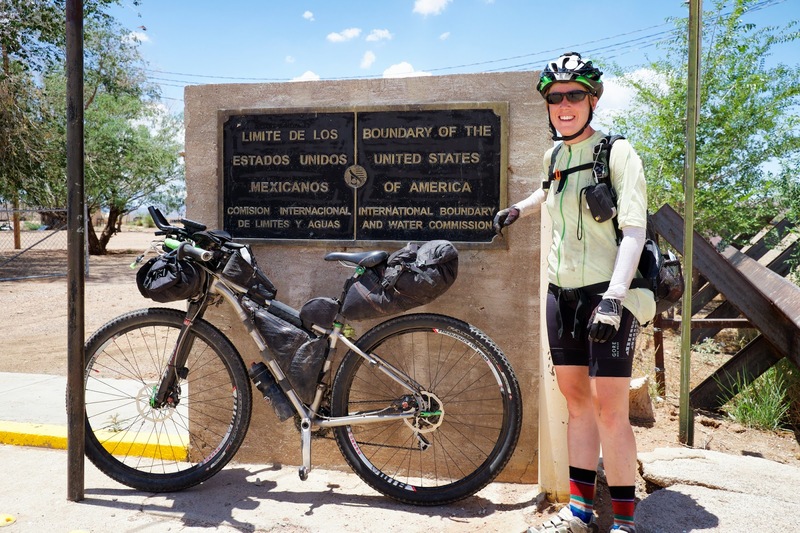 The bars and grips kept me comfy on a 550 mile stretch of the Great Divide this September. Here are a couple links to shots of the bar. One with aero bars and one without. Links are on Flickr. Happy trails! I've got a Ti Faro, getting a Ti Jones H tomorrow (if FedEx delivers as promised). Woodchippers have served well but time for a new page. So goodbye Rivals on the drops but what should replace them on the H Bar ?? I'm thinking Pauls Thumbies but what levers...my Fargo is XO 2x10 SRAM. Any thoughts/suggestions appreciated. Ti Jones on a Ti Fargo should be sweet! Paul's Thumbies should work great. I'll likely go to a Microshift thumb shifter for my Shimano system when my grip shifters finally give up. I like the option of going to friction mode. The Paul's Love Lever 2.5 (long version) have been awesome for me. That is as long as you've got mechanical discs. We've used road version calipers with mtb brake levers with no problem. Using mtb calipers and road levers is problematic though due to the lever/cable pull ratios. Have a blast with the new setup! How would these work on a Pivot mach 429. 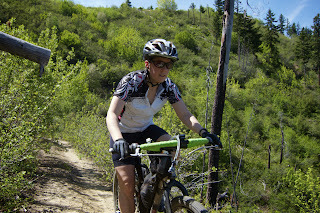 I mainly beat around on single track stuff. With a back being closer to 50 I love the idea of being able to change positions to relieve the nagging aches that come with age. Not really familiar with the Pivot bikes. I've seen the Jones bar on any number of various bikes now. Most people seem to love them. Do be aware of the effect of shortening your reach on the bike due to the sweep of the Jones bar. A longer stem might be in order. Of course a more upright position could be perfect for your back. Cheers! Thanks for your writeup. I'm debating between a fargo and el mar right now. Really want something without shocks and not sure if I'd like the woodchipper on the fargo or not. I've not done much long ridding but headed that way. Since 84 I've been on flat bars. I really enjoyed reading this! I've had my Fargo for about 2 months, and I'm having trouble finding reviews of it from other short women. (I'm 5'2", and I have the XS.) Thanks for this, even though I know I'm late to the party!